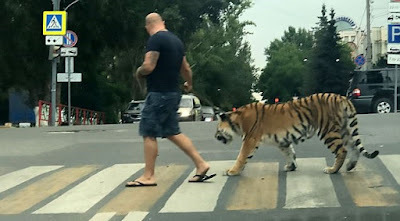 Pedestrians cowered in fear when they spotted a man taking his pet Tiger for a walk in the centre of a Russian city. 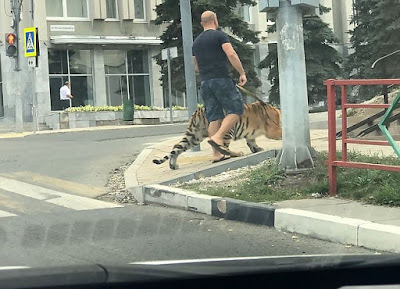 Jaw-dropping footage shows the man walking his big cat on a lead in the city of Samara in southwest Russia. A shocked onlooker filmed the scene while travelling in a passing car. Some people believe the man seen walking the beast could be the circus artist and animal trainer, Artur Bagdasarov. 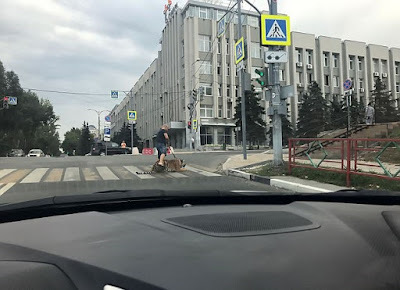 Other pictures show the huge animal having a rest and lying down on a zebra crossing. The tiger seemed to be calm, and no one was reported to have been hurt. But one internet user slammed the owner for not using a muzzle on the animal. » Watch Pastor Adeboye Say Men Who Get Wives Through Facebook Would Lose Them Through Youtube.